* as always, numbers in brackets [x] represent game totals, while numbers in parentheses (x) represent season totals. 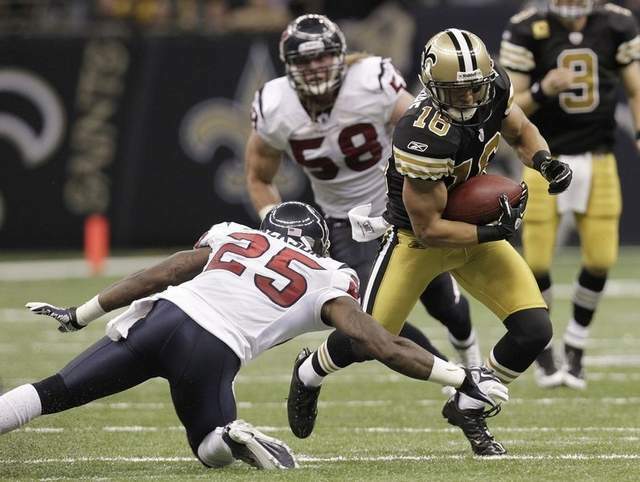 * Lance Moore played perhaps his best game as a Saint, totaling a career-high 9 catches for 88 yards and 1 TD. Moore also added two key 2-pt conversions in the fourth quarter. Both conversions came on the exact same route which was, not coincidentally, the same route he ran for the crucial 2-pt conversion in the Super Bowl. With 9:08 remaining in the fourth quarter and the Saints trailing 26-24, Moore caught five passes in six plays. Specifically, those plays were: 8 yard reception, 8 yard reception, 4 yard reception, 16 yard TD reception on a crucial 3rd and 6, and a 2-pt conversion reception. Then, maybe most importantly, with the Saints trailing 33-32 and backed up to their 7 yard line with 4:13 remaining, Moore caught a key 15 yard reception down the middle to give the Saints some much needed breathing room on their game-winning drive. * What else can you say about Drew Brees at this point? Brees overcame two interceptions and some big hits from the Texans defense to lead the Saints back from a 9-point, fourth quarter deficit. Moreover, Brees led the Saints to a franchise-high 23 fourth quarter points. In the fourth quarter, Brees was 12/17 for 160 yards and 2 TDs. The game-winning, 93-yard TD drive was reminiscent of the game-winning TD drive against the Falcons in 2010, when Brees led the Saints 90 yards for the winning points. Brees' poise and confidence in high-pressure, game-defining moments is what separates him from his peers as an elite NFL QB. Sunday, Saints' fans were again reminded of this. * The first-half red zone defense probably saved the game for the Saints. The Texans took the opening possession 92 yards for a TD and put the Saints in an early hole. The Saints' defense continued to reel, giving up big chunks of yardage play after play in the first half. Thankfully for the Saints, the defense was able to muster three key red zone stops that resulted in FGs for the Texans. Leading 7-0 midway through the first quarter, Houston reached the Saints's 4 yard line but settled for a FG. Then leading 10-7 midway through the second quarter, Houston reached the Saints' 9 yard line before kicking another FG. Then, after a Brees INT on the first play of the next drive, Houston settled for yet another FG after reaching the Saints 9 yard line, giving the Texans a 16-7 lead. The Texans threatened time and again to blow the game wide open in the first half but to their credit, the Saints' defense came up with key 3rd down stops to force FG attempts. This "bend, don't break" defense was vital in the Saints' comeback victory. * The Saints' first quarter woes continue. To date this season, the Saints have been outscored 38-10 in the first quarter. Yet again, the Saints' defense allowed big chunks of yards early on before settling down later in the game. Thus far this season, the Saints have trailed 21-7, 7-3, and 10-0 after the first quarter. This is a trend that needs reversal if the Saints intend on competing for the NFC title. * The Saints' inability to generate pressure with their front-four remains an area of concern. Shaun Rogers was mostly invisible for the third straight game, and DEs Will Smith, Cam Jordan, Junior Gallette and Turk McBride combined for just one sack and one hit on Matt Schaub. In an effort to compensate for the lack of front-line pressure, Gregg Williams continually resorted to a series of exotic blitzes which left the Saints' pass defense exposed and vulnerable. Time and again on Sunday, Texans' WRs and TEs found themselves in open space down the field. 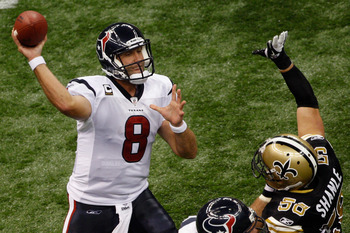 As a result, Matt Schaub gashed the Saints for a staggering 17 yards per completion. * Unfortunately, the injuries continue to pile up. The Saints entered week 3 without key contributors Jonathan Vilma, Marques Colston, Tracy Porter, and Garrett Hartley. After earning the first start of his career, and making an early impact with a hit on Matt Schaub and an excellent special teams tackle, Martez Wilson left the game with an apparent arm injury in the first quarter and did not return. Zach Strief went down with what appeared to be a right knee injury. Strief was helped to the sideline and then carted to the locker room. Thus far this season Strief has been consistent, if not excellent, in both phases of the offense; if he's lost for an extended period of time, Charles Brown will be his replacement. Brown performed admirably in Strief's absence on Sunday. Olin Kreutz also left the game due to injury in the first half, and had his left knee taped by trainers on the sideline. Brian de la Puenta replaced Kreutz at center. Kreutz remained on the sideline for the duration of the game, so perhaps his injury is not as significant as Strief's. The health of the offensive line will be a key area to monitor in the coming weeks, as this unit is perhaps most critical to the Saints' overall success.